Disclaimer: This post contains affiliate links… which means I MAY receive a commission (at no extra cost to you) from any purchases you make via these links. But, as always, all thoughts and opinions are my own, and I wouldn’t endorse or recommend anything I didn’t personally use and love! Thanks for supporting The Crafty Cat Company! 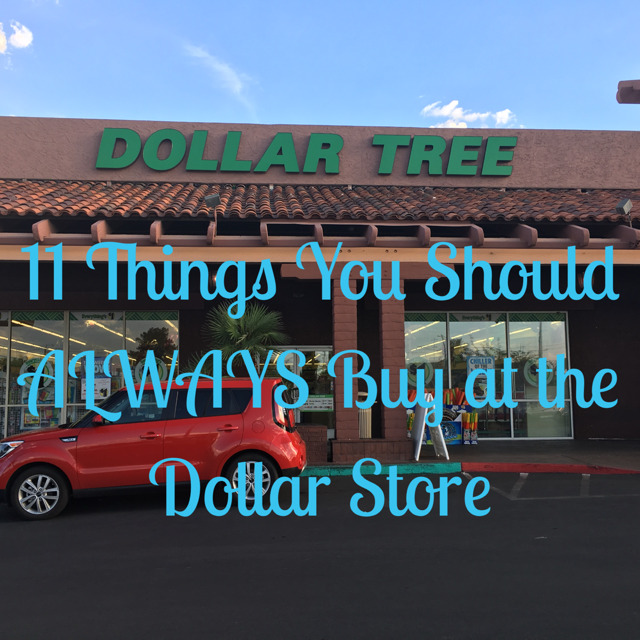 Do you ever shop at dollar stores? A lot of people don’t, either because of misconceptions about the quality or variety of the items for sale, or just because they’re just oblivious or unaware of the whole “dollar store” concept in general. 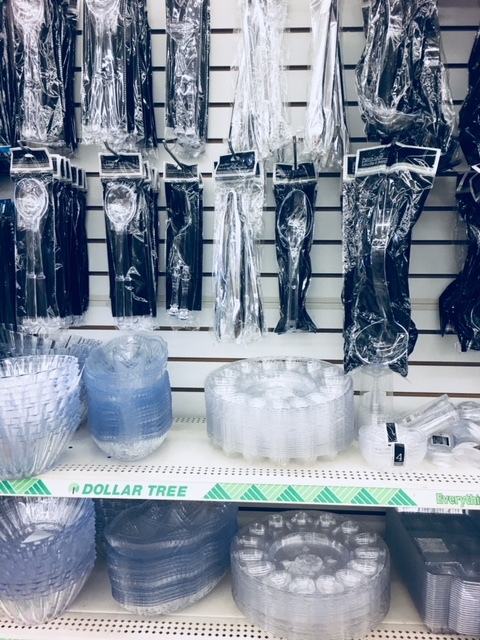 But nowadays, dollar stores, Dollar Tree in particular, have more locations than ever before, all across the country… not to mention, a wider selection of quality merchandise. 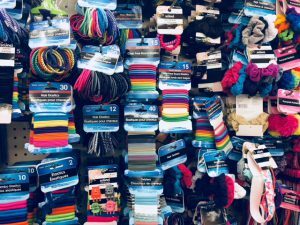 In order to compete with big-box retailers like Target and Walmart, dollar stores have really stepped up their game in recent years, much to the delight of consumers. Growing up in the 100+ degree Las Vegas summers, our family spent a lot of time in the pool. 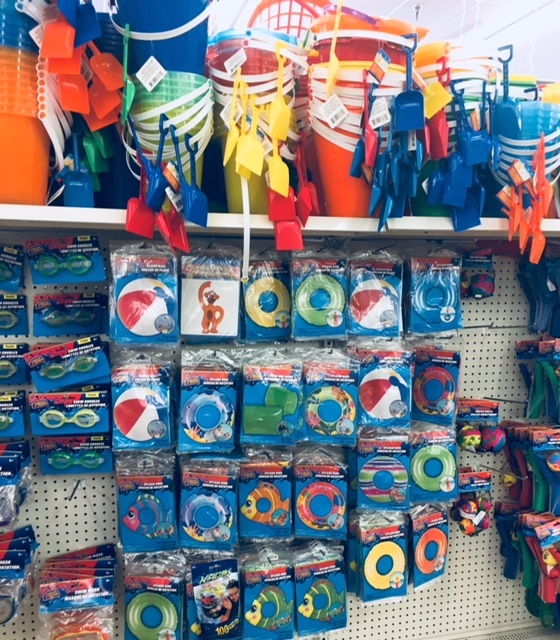 We had just about every kind of water-related accessory you could think of at one point or another… inflatable rings, beach balls, squirt guns, buckets, diving toys, goggles, pool noodles, and more. But, as we all know, kids are not always very thoughtful or careful with these items, especially in an outdoor setting. It wasn’t a rare occurrence for something to break from rough play, or by getting forgotten outside in the blazing sun for days on end. By purchasing these things at the dollar store, you save yourself from a lot of anxiety and buyer’s remorse. Who wants to stress over kids’ toys, especially ones only used for a few months out of the year? This way, if a pail and shovel gets left behind after a family trip to the beach, no big deal. Or if little Johnny breaks his squirt gun, you’re not hit with a big financial loss. As many of us have found out the hard way, throwing a shindig can cost a small fortune, if you’re not careful. 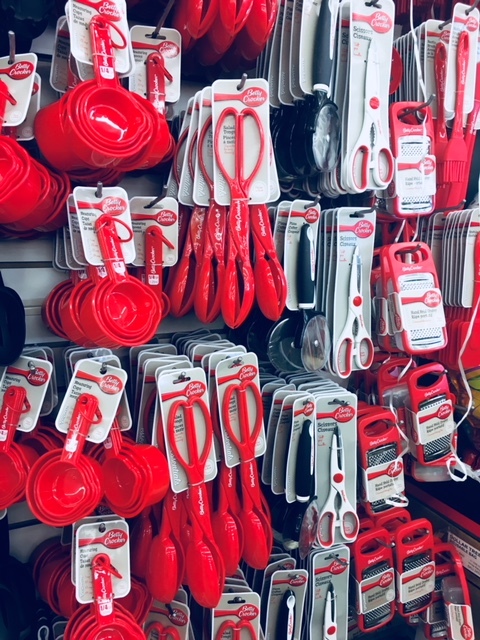 Especially if it’s one where you’re purchasing a lot of party supplies that are only getting used a single time… disposable cutlery, napkins, plastic cups, plates, tablecloths, balloons, etc. 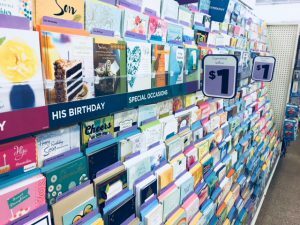 You can find almost the exact same stuff at specialty party stores and big-box retailers for double or triple the price, because they figure that while you’re there buying the gift, food for the party, etc., that they can capitalize on the convenience factor and sell you cheaply-made party products at a big markup. But if you’re willing to make that extra stop at the dollar store, you can really be the one capitalizing- on the big bargains! They have sets of the aforementioned products in lots of different coordinating colors and designs. Plus birthday candles, party hats, even cake mixes and frostings…pretty much anything you could possibly need. Oh, and don’t forget about those mylar balloons– for only a dollar, you can buy one and get it filled with helium. Heck, you can even get several for less than it would cost for a single one at just about any other store! 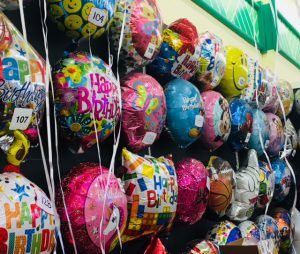 One word of caution though, balloons seem to be pretty popular items at just about every location I’ve ever been to, so it’s worth calling the store before you go, to ensure they have the design you want available. Nothing takes the enjoyment out of a fun gathering quite like stressing about whether or not your late Aunt Myrtle’s serving dish is going to make it home in one piece after the raucous company picnic. That is, if Mrs. Bob-from-Accounting doesn’t mistake it for hers and take it home first. Who wants to worry about that kind of stuff, when you should be relaxing and having a good time? I know I don’t. For pretty much any kind of function where you need to “bring a dish to share”, the dollar store is absolutely the way to go. You can find serving bowls, platters, and utensils of all kinds, and if something breaks or goes missing during a gathering, you won’t end the night in tears. 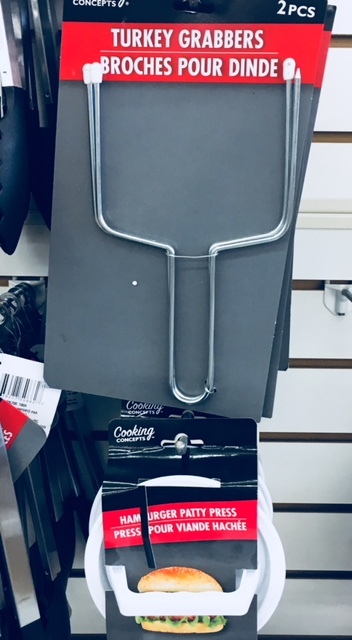 Also, if you’re looking to bring a hot dish along, the dollar store usually has disposable foil pans in quite a few shapes and sizes available, for much less money than they usually cost elsewhere. 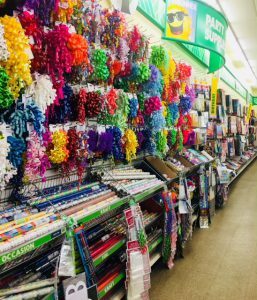 Whether it’s finding a vase for the beautiful flowers your boyfriend sent you, or buying wine, margarita, or martini glasses for a cocktail party, the dollar store is probably not the first place where you think of looking for these things. 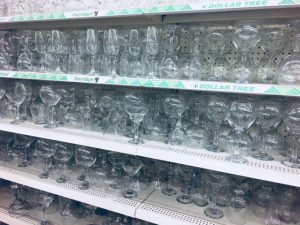 But, surprisingly, dollar stores increasingly seem to have a large selection of glassware on hand. And if you’re anything like me, you don’t want to spend a ton of money on anything made of glass if you’re accident-prone… or don’t actually drink much alcohol! Almost nothing feels like a bigger waste of money than wrapping paper, am I right? You buy a roll for $5, wrap the gift, and in ten seconds, the paper is completely shredded and gets thrown in the trash (especially if it’s an excited child doing the unwrapping). Or we are in a rush and don’t have time to wrap anything so we have to buy a pricey gift bag, tissue paper, etc… and then the recipient has to figure out what to do with it afterwards, because lots of us feel guilty about just tossing a nice bag you know someone paid at least several dollars for. What to do? You guessed it, go to the dollar store! They have rolls of gift wrap and gift bags for just about every occasion and holiday that comes up, as well as accompaniments like bows, ribbons, etc. Then you can enjoy watching the kids go crazy on Christmas morning or their birthdays without regretful feelings. And guys, seriously, BUY YOUR GREETING CARDS AT THE DOLLAR STORE! They have many of the exact same cards that are sold in other places, but for much, much less than the face value. It’s a great feeling turning the card over and seeing that you’re getting a $4 card for a buck! Maybe you’re looking to reward your kids for good behavior by letting them pick out a toy while you’re shopping. Or you’re taking a long road trip and need something to occupy their time while sitting for long hours in the car. Even at Christmastime, in addition to regular presents, most of us have a stocking that needs stuffed, and at birthdays, what child doesn’t love a bag of goodies to take home? 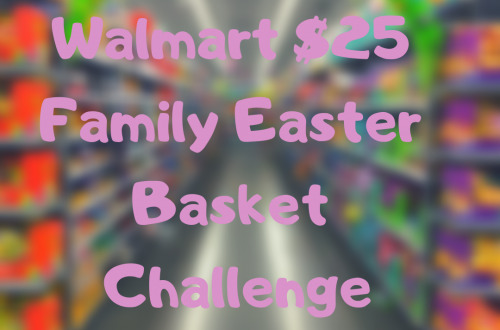 If you choose to shop at the dollar store in all of these scenarios, you can get away with spending way less money. Most parents don’t want to set the standard of getting their kids something extravagant and expensive in every situation. And honestly, most kids would be just as thrilled to receive a cheap container of Silly Putty or Play-Doh, a Whoopie Cushion, coloring book, or action figure instead. Especially on birthdays and at Christmas, you’re likely already spending plenty of money on other aspects of the holiday, so this is one place you definitely don’t want to bust the budget. 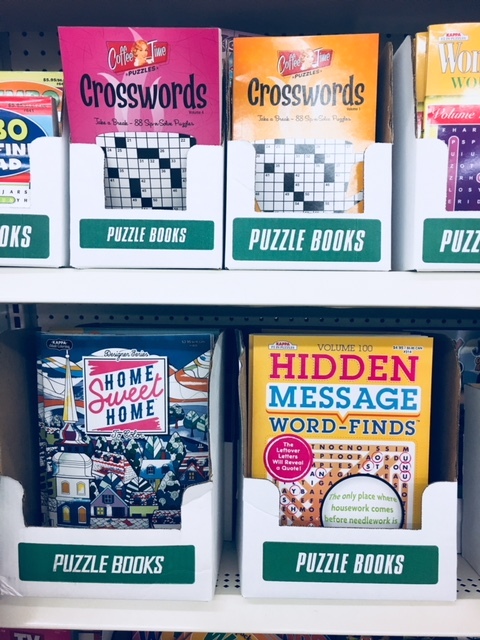 There are plenty of goodies to be had for adults as well… crossword or Sudoku (my favorite!) 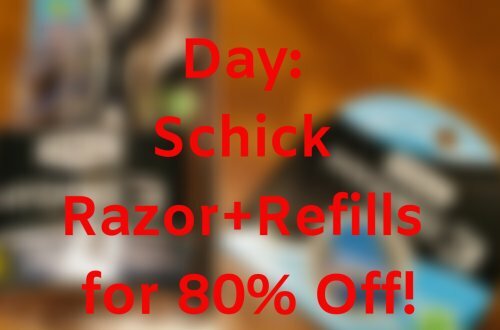 books, nuts and candies, small bottles of lotion, nail polish, or other personal-care items, puzzles, stationery, and more. Although, let’s be honest, I wouldn’t complain if a Whoopie Cushion showed up in my stocking either! Pregnancy tests at the dollar store. Yep, they have them… and supposedly, they actually work pretty well. 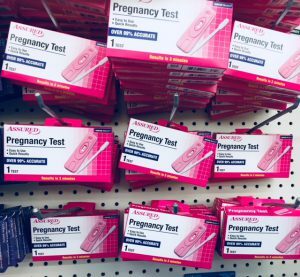 In addition to pregnancy tests, they have hundreds of other products to cater to most of your grooming and personal needs. Nail clippers, shampoo, Q-Tips, Aspirin and other pain relievers, lotion, cosmetics, toothpaste, you name it, the dollar store probably carries some version of it. My favorite thing in this category to purchase there would probably be hair accessories like bobby pins and hair elastics, because they get used every day, and have a tendency to go missing. It’s definitely nice to have a less-expensive source for obtaining these items when you need a fresh supply. As always, when you’re buying and using anything that will be in contact with your skin/body and/or ingested, read labels and know what you’re getting. If something seems questionable, or you’re in doubt, don’t buy it. I don’t know about you, but I hate spending a lot of money on stuff that’s pretty much just going to get covered in filth of some sort. Who wants to buy an expensive plastic brush just to scrub a toilet? Not me! 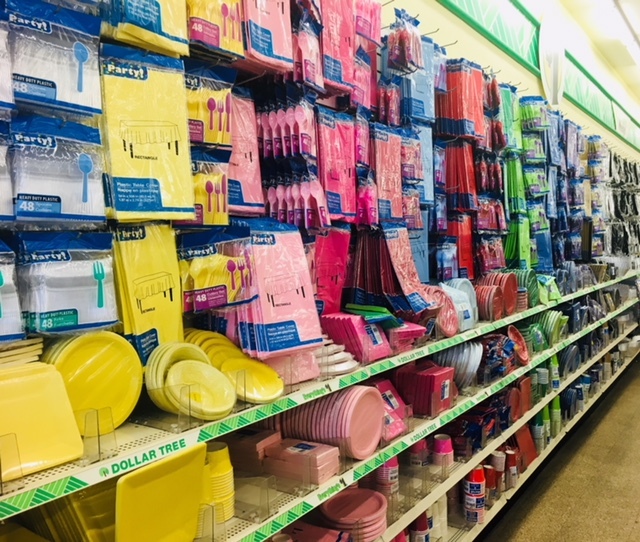 There are so many products offered at dollar stores, (too many to mention here!) and it’s a great way to clean your house, but not clean out your wallet at the same time. My favorite things to buy are sponges, gloves, and various types of scrub brushes. 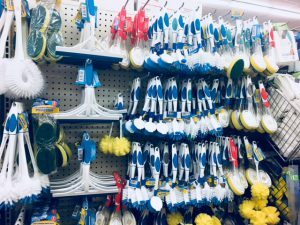 I also know of a few people who rent out their homes to others through vacation-rental websites, and they consider the dollar store the place to go to keep their homes stocked with cleaning supplies as a nice amenity for their guests. Something to consider if you’re in a similar situation! And same as with products in the previous category, read the labels of any chemically-based items or ones that will come in contact with your body, and use your best judgement. This one’s pretty straightforward. No one likes sending food home with guests, and then having to track them down and nag them into submission so you can get your nice Tupperware back. However, you still want them to be able to get their food home safely. The answer: plastic food-storage containers from the dollar store! Of course, being a less-expensive product, many of these items are made with thinner plastic and aren’t meant to last forever. But it’s still a cheaper alternative to the similar, “disposable-type” containers sold at other stores. 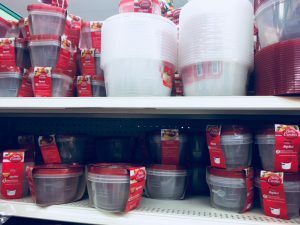 I have a family member who throws a holiday party every year and buys a ton of these so she can send guests home with the leftovers, without caring if she ever gets the containers back. Also, these are good alternatives to keep on hand for yourself if you’re storing something that might stain the plastic, such as is often the case with tomato sauces. You won’t feel as bad for tossing or recycling the plasticware if it’s too damaged, whatever the cause. These are also a good item to use for general storage around the house as an alternative to pricey specialty plastic containers and boxes, especially for craft items. We probably all are guilty of this at some point in our lives- buying that nifty little kitchen gadget that you just can’t do without. But then, you do without. The thing gets used once in a blue moon, or not at all, and takes up precious cabinet or counter space in your kitchen for time and all eternity. Of course, on Thanksgiving you may actually need a baster and turkey grabber/fork things. Just buy ’em at the dollar store. Then if they do languish in a drawer forever after, then at least you didn’t waste a lot of money. And if it’s something that you end up using regularly and becomes an essential part of your kitchen, it’s an added bonus. I’ve purchased a few of my kitchen tools this way, and in my experience, they’ve all held up pretty well. The only thing I can think of that you may want to be wary of purchasing is sharp knives, but I think almost everything else is worth a shot. 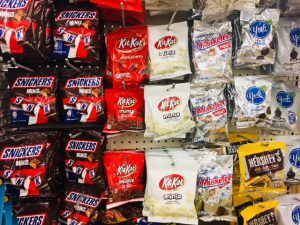 From cookies, crackers, and candy, to heads of lettuce, and everything in between, dollar stores can carry a surprisingly large variety of edible items. You may be surprised at how many name-brand products they even have. 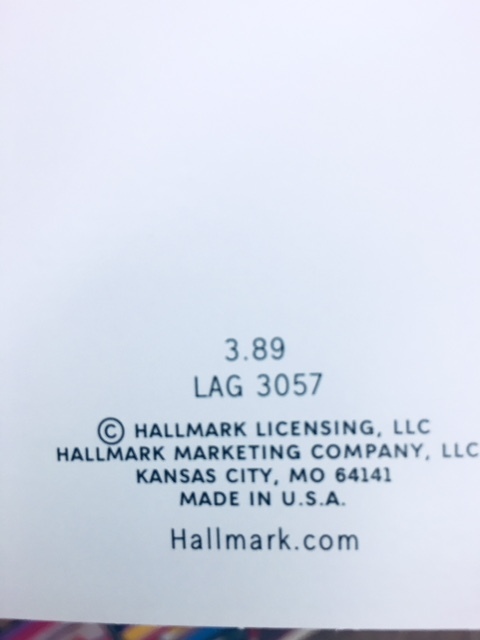 Sometimes, they’re just smaller packages than usual, in order to make them cheaper, but I’ve found many a full-size, name-brand product at the dollar store. Once it was Mint Oreos (my favorite kind, so of course I bought some! ), and the next day at the regular grocery store, they were on SALE for $2.99! Three times the price! 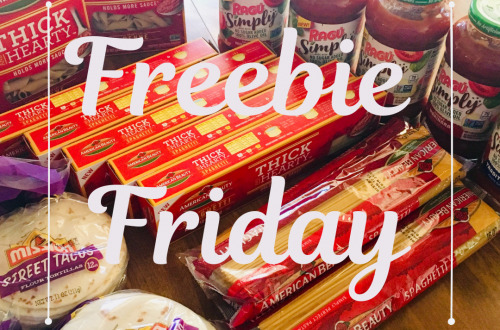 If you’re lucky, your dollar store may even have a refrigerated/frozen food section, or even carry produce and bakery items! Most of the stuff I’ve seen in these sections was of comparable quality to what you’d find in a regular grocery store. Some of my favorite finds have been asparagus, bags of onions, salad mix, and bananas. Even loaves of good bread and really nice bagels. Items available can frequently change, so if you see a good buy, don’t hesitate to grab it! Of course, when it comes to food, read labels, check expiration dates, use common sense, etc. But don’t be afraid to go grocery shopping at the dollar store! Whew, what a list! 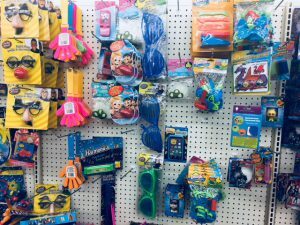 These are my favorite dollar-store items, what are yours?